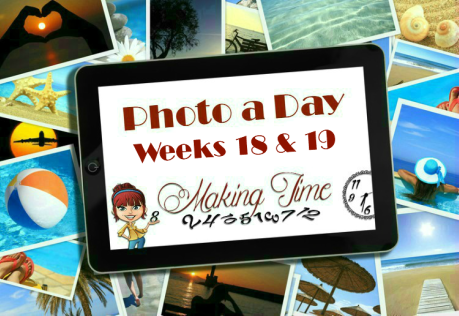 It’s been a while since my family has taken a vacation, so it was time I took action and planned something fun for us. Rather than going all out and traveling far, I decided to find something that was a little closer to home. I know that when people think of a vacation, they think of somewhere far away. 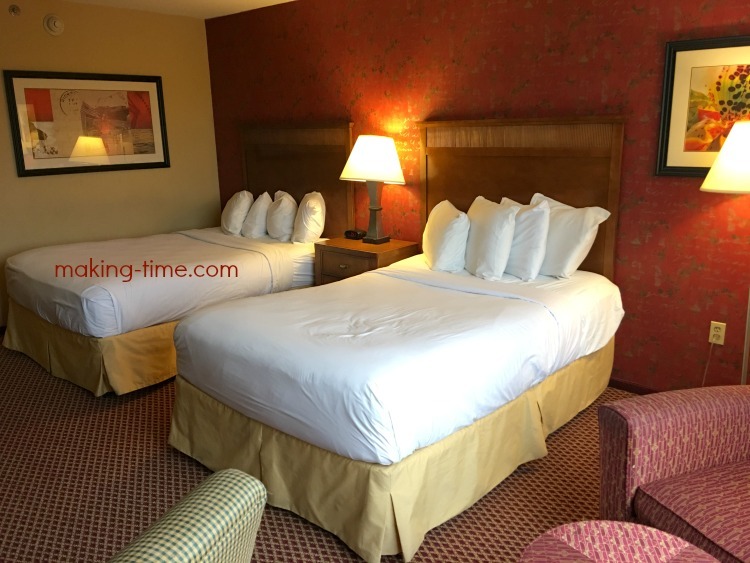 I did think about going away from home for this vacation, I even took a look at the Denver hotel near Coors Field, but for the time being I think a staycation (going on a vacation that isn’t too far from home), is the easiest thing that I can do. I would love to be able to go on vacation more often though. I have one friend who travels all the time, they even use a company called NetJets to help them travel to places. As much as I would love to do this, I just don’t have the time. 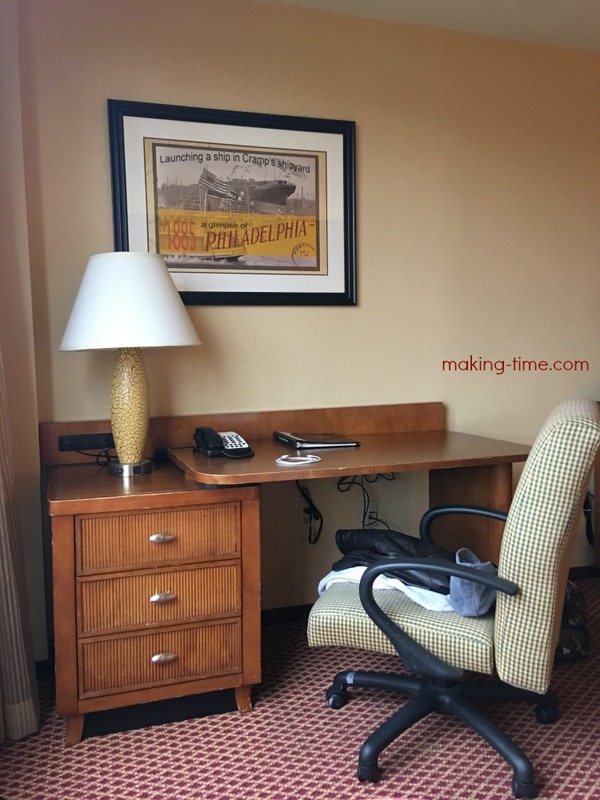 Since moving to NJ last November we haven’t really ventured out of our immediate area, so I thought a short staycation would be a great way to get out of the house, explore the state and enjoy some time together. So where did we go? We spent the weekend at The Hotel ML! 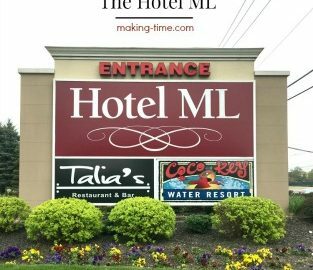 Just about an hour and a half drive from our home, The Hotel ML is situated in Mt. Laurel, NJ. The hotel itself is very beautiful. The entrance is gorgeous and very inviting. As soon as we stepped foot into the hotel lobby, I was blown away. There’s obviously the front desk, two sitting areas and a lounge where you can enjoy some beverages and watch a little TV. Everything appeared to be new and modern, and if it’s not new, then they’re doing a good job of keeping it up. To the right of the lobby area there are meeting rooms for private events, such as conferences, wedding activities and other social events. In fact, I believe someone was hosting wedding activities the evening we checked in. I overheard their party talking about it while passing through the lobby the next day. To the left of the lobby area is the elevator and rooms. Our third floor room at The Hotel ML was a very nice size. It was probably the largest hotel room I’ve ever stayed in and the kids were able to run around to let out a little of their excitement. With two double beds, a lounge chair and ottoman, office desk, dresser with TV and mini fridge, and full bathroom, it was a home away from home. After arriving we headed to the closest store to pick up a few snacks and drinks to stock our mini fridge. 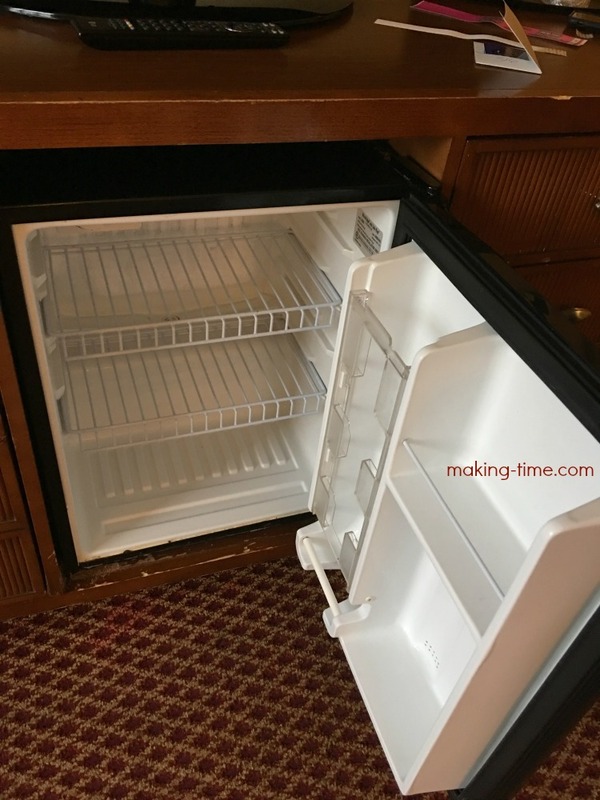 This was great because the kids are always wanting something, so having the mini fridge helped save us some money on food and drinks throughout the weekend. While it was a spacious room, there were a few things that could use some improvement and it’s mostly all aesthetic. 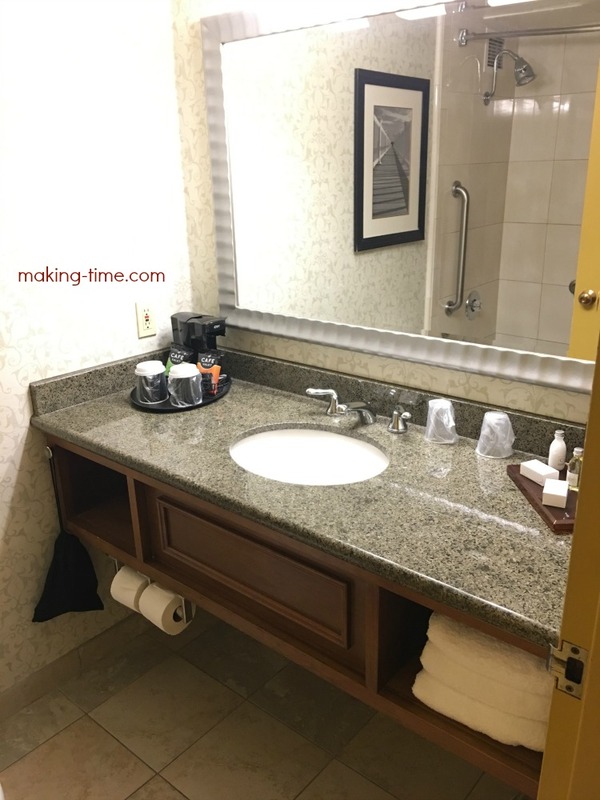 I was told the room was newly renovated, but the only thing that looked new was the bathroom sink and counter. 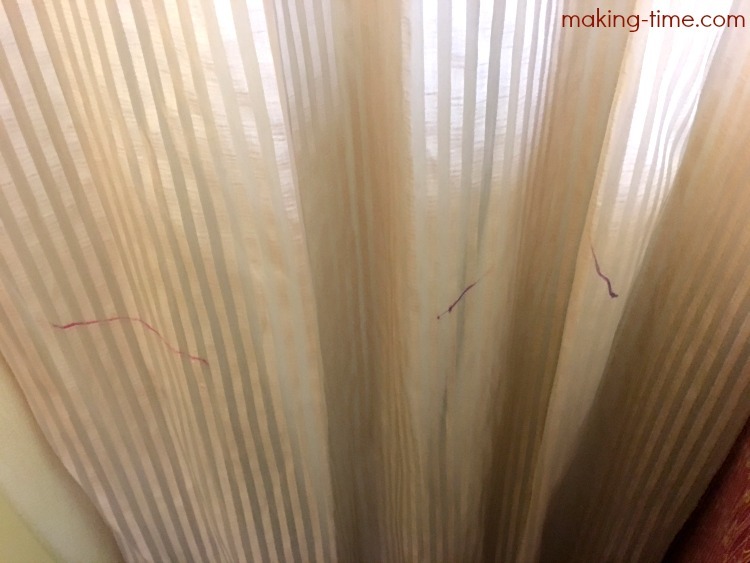 There were marker lines on the window curtains, most likely caused by kids during a previous stay. But it’s a kid-friendly hotel, so things like this are to be expected now and then. The furniture and mini fridge were also pretty dinged up. Again, this is something that can be expected with the traffic that comes in and out, but it was very obvious and immediately noticeable. This was the view from our large room window. Since it was 50 degrees out the pool was closed, hence the pool cover. Another issue was the mattress or bed springs on one of the beds was broken, I think. I didn’t even notice it until the day we left because I had been sleeping on the other bed, but I sat on it while getting ready to leave and drastically sunk down. 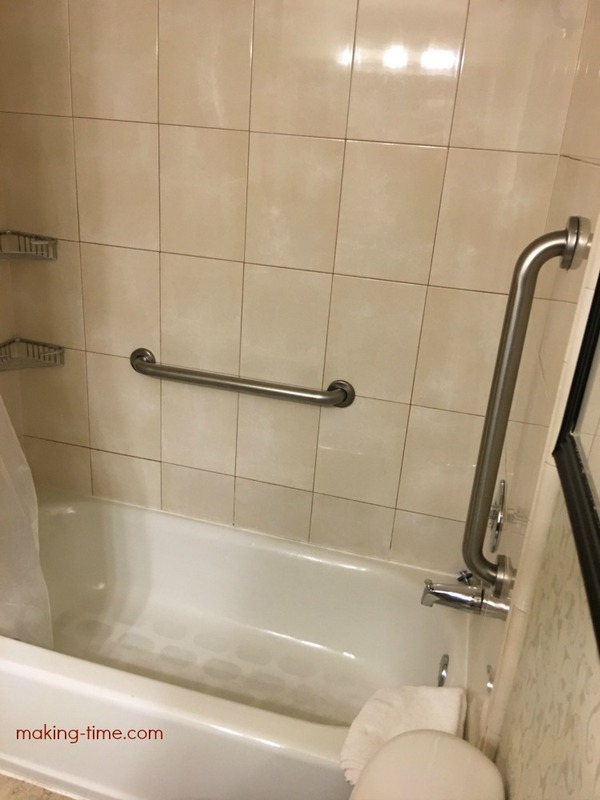 So again, nothing in the room really stood out to me as being renovated besides the bathroom sink. While I’m on the topic of the bathroom, I also want to note the toilet was lower to the ground than an average toilet. Not a complaint, but just something to mention. This is actually great for the kids, but as an adult you better make sure you have your squat game on point. After being blown away at the entry and lobby area, I was expecting a bit of a nicer room. Overall, the room was okay and I’d consider it pretty average. Nothing too over the top and fancy, but it was suitable for our weekend stay. If you get a little hungry, you can always order room service or head down to Talia’s. Situated just behind the lobby lounge is Talia’s Restaurant and Bar. Unfortunately, we didn’t get a chance to dine at Talia’s, but they serve up-scale comfort food all day. 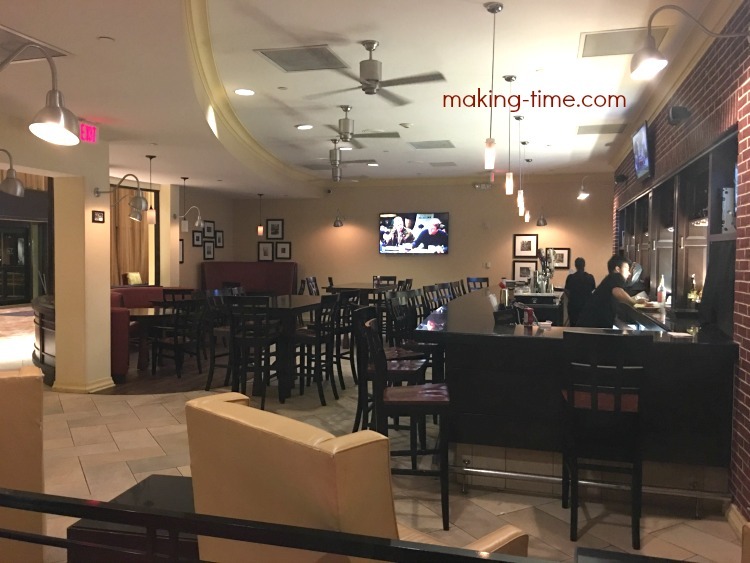 In the morning you can enjoy a breakfast buffet, and for lunch and dinner you can order dishes like Short Rib Grilled Cheese, Portobello Sandwich, half pound Black Angus burger or Cajun Seared Salmon, just to name a few. 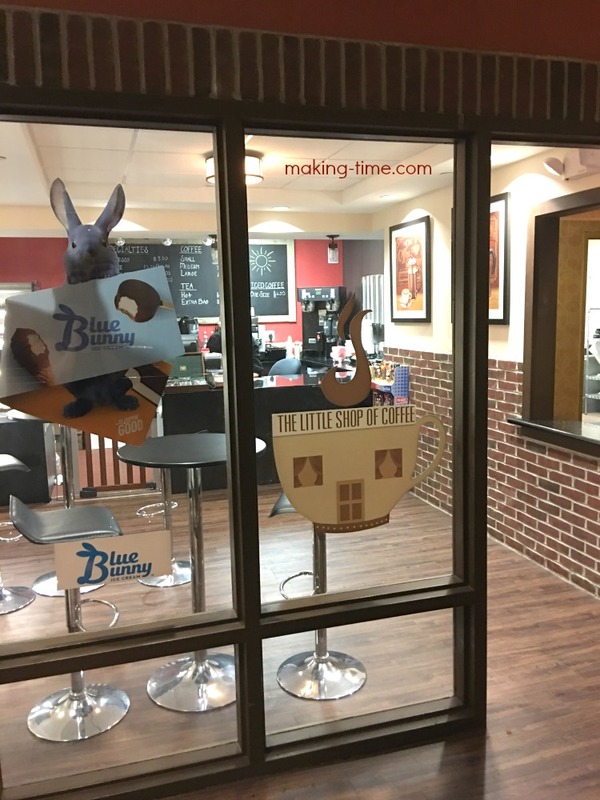 If you’re just looking for a snack, sweet treat or cup of coffee, I suggest heading to The Little Shop of Coffee, located between the elevators and front desk. You can find snacks, ice cream treats, a variety of coffees and a table or two to just sit and enjoy some conversation. There’s also PLENTY of off-site dining options, too. Starbucks, Ale House and Bob Evans are just across the street from the hotel. And in the general area, a short ride will take you to any restaurant you can imagine. It would take me a while to list them all, but during our stay we dined at Don Pablos, Cracker Barrel and Grand Lux Cafe. 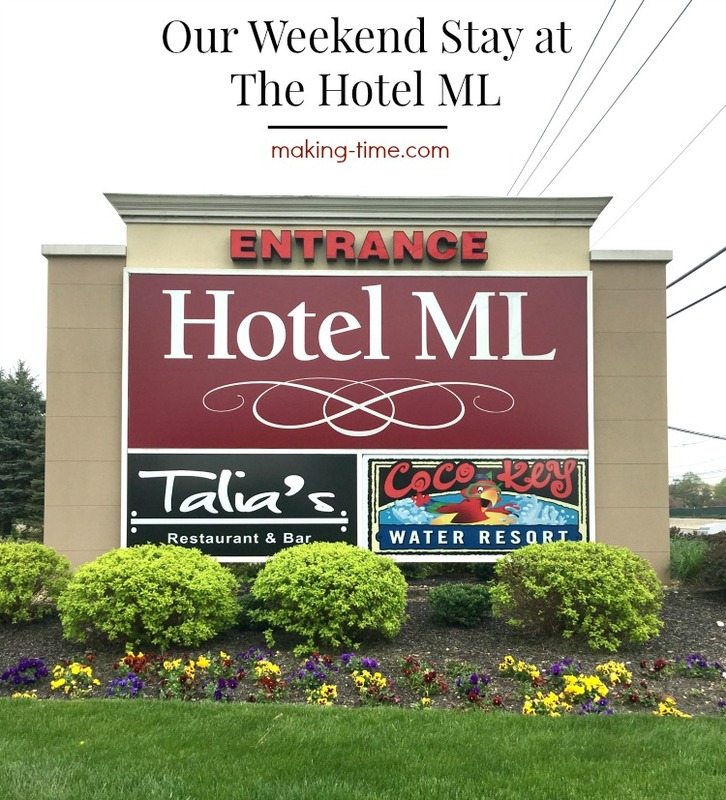 So, you’re probably wondering what’s so great about The Hotel ML that we chose to spend our weekend family staycation there. The answer is simple – CoCo Key Water Resort! The kids had a blast and I can’t wait to tell you all about it – tomorrow, haha. Sounds like fun, right? I’ll give you a little info now, just to be fair. CoCo Key Water Resort is on the same premises as The Hotel ML. It’s housed in a separate building towards the back of the property, but can easily be accessed from the hotel. 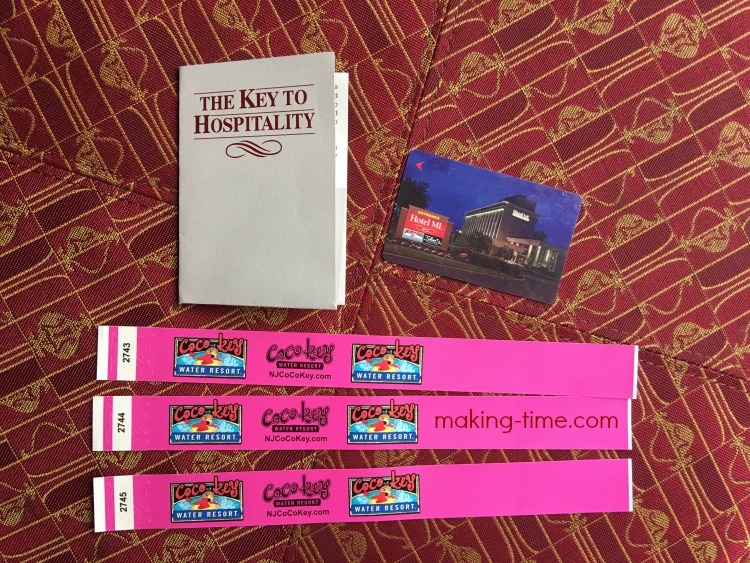 One of the CoCo Key wristbands is missing because my son just couldn’t wait to get his weekend fun started. 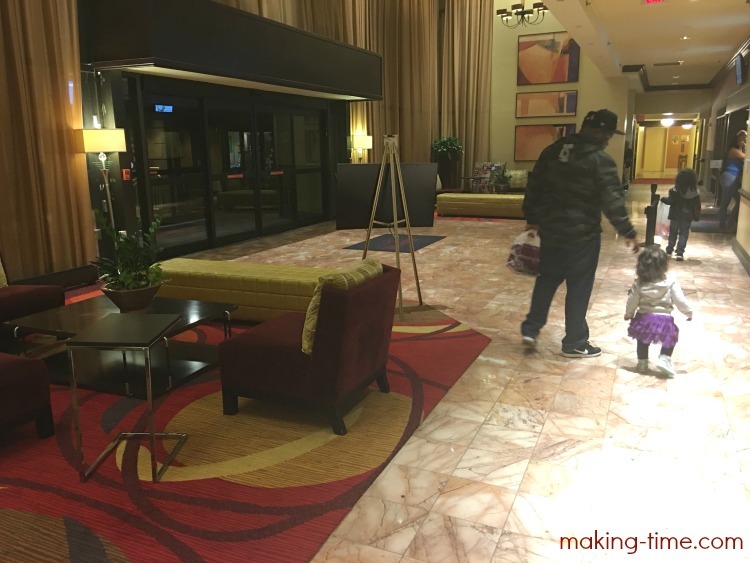 As soon as we left the lobby area and walked to the elevators, we could smell the chlorine so there’s no missing the fact it’s there, even if you’re not visiting the hotel for purposes of the water park. To get there, just take the elevator down to the first floor (the lobby is on the second floor) and walk your way through the halls. 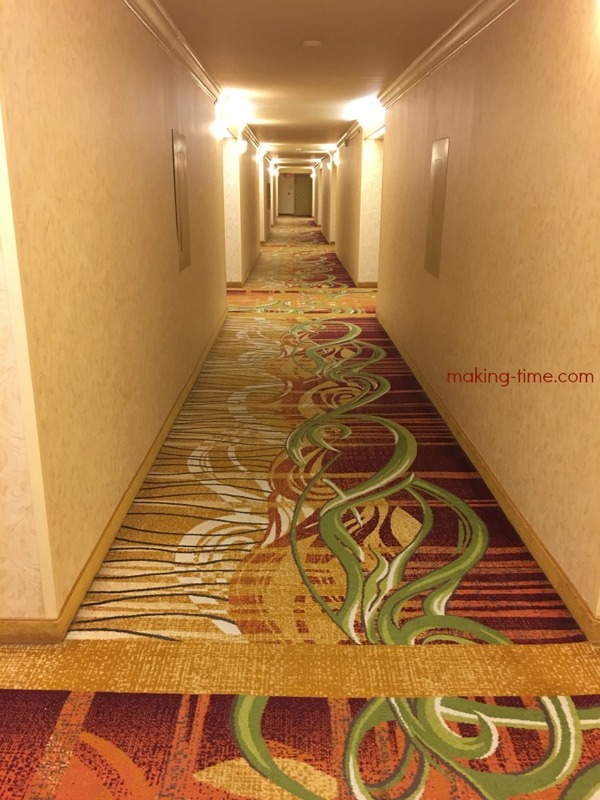 There are rooms on the first floor, so I would assume if you’re staying on the first floor, you’re probably going to hear a lot more noise and traffic as hotel guests utilizing the water park make their way through the halls. 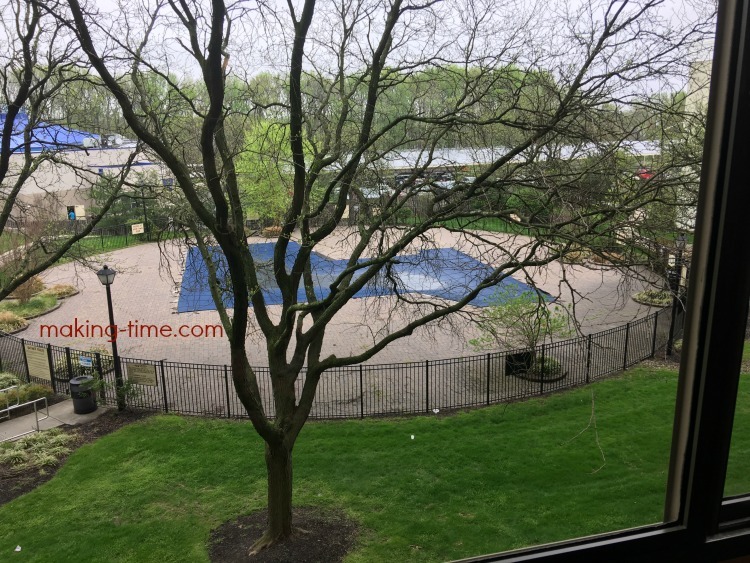 But just a short one to two minute walk and you’re ready to enjoy some indoor water park fun! 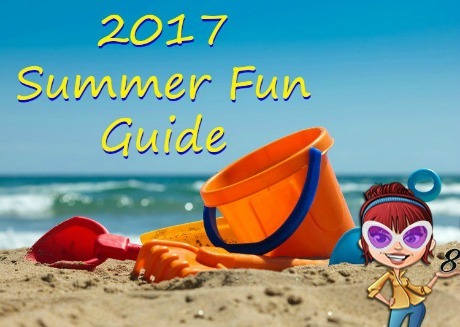 Aside from the on-site fun of CoCo Key Water Resort, there are also some fun things in the general area to do. Want to do some shopping? Head to Moorestown Mall or Cherry Hill Mall. 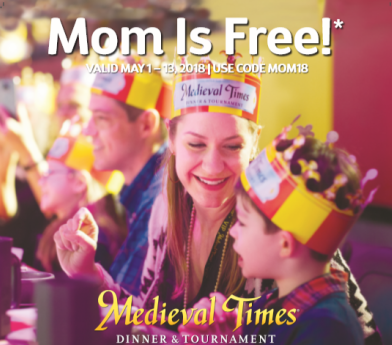 Want to do something fun with the family? There’s a bowling alley right down the road or spend a few hours at Sky Zone Trampoline Park. Still not enough? Make your way to The Funplex for bumper cars, laser tag and more! I had no idea there was so much to do in the Mt. Laurel area. It was nice to get out of the house and have a mini family vacation, while exploring what our new home state has to offer. I can’t wait until our next staycation! When and where was your last staycation? *This hotel stay was provided at a discounted rate for purposes of this review. My opinions are still 100% my own and in no way influenced by the brand. Any claims or statistics should be confirmed with the brand. Please see this blog’s full policies and disclosure here. It’s kind of a bummer when you go somewhere and the room doesn’t live up. That spring in the mattress would drive me CRAZY. The hotel looks lovely. When I travel with my family, finding a nice hotel which is also comfortable is very important to us. I like how the hotel also featured a restaurant. 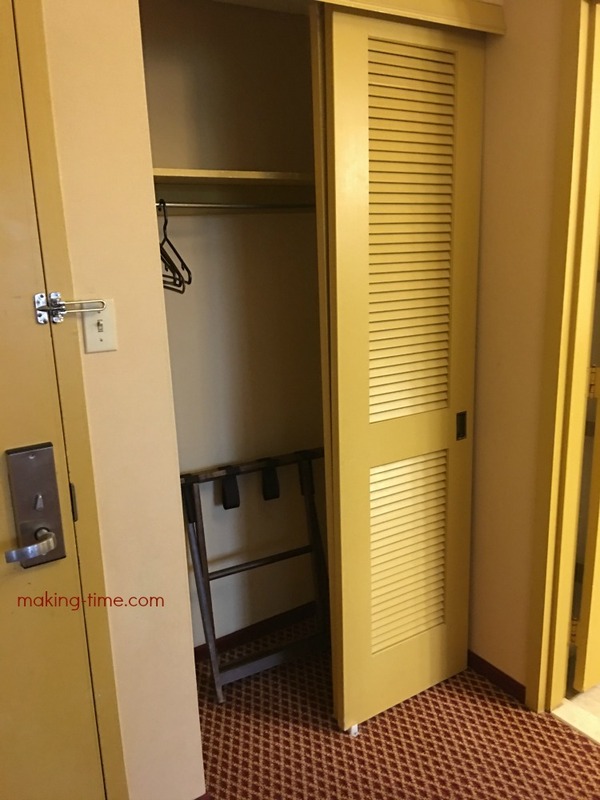 This can definitely come in handy if you don’t want to leave the hotel, especially on bad weather days. So nice hotel, i love the photographs and everything is so cool and clean. Nice view of the pool. Glad you have shared with us. Apart from the room itself, the ambience was really soothing. Hope you had a nice stay. Cheers! Glad that you and your family had an enjoyable stay at Hotel ML. Your room looks cozy and have complete facilities.. And oh the bathtub! Hope you enjoyed that tub too! This is my first time hearing about this hotel but it looks like it’s been around for a long time, the rooms are a little outdated. I wouldn’t have been able to sleep with the bed like that. This hotel looks so fun and amazing. I love when hotels have things that kids can do, or local attractions within walking distance. looks like a great hotel. i have a chronic illness so i always make sure there is a mini fridge in the room. i’ll have to check this place out sometime when i’m there. Looks like a great hotel! I love how clean and new everything looks and feels. I have always wanted to go and stay at a hotel nearby for a staycation. Where we live, the city center is about 40 minutes to 1 hour away, and so we never go there, and it would be so nice to stay at a hotel and go sightseeing for a few days in downtown! Looks like a great place to stay, I too love the lobby and that bar looks super classy and a wonderful place to unwind with a glass of wine! To bad it was cold out the pool also looks amazing!